Harold Pinter’s 1967 Tony Award-winning Best Play returned to Broadway in a new production under the direction of Tony Award-winner Daniel Sullivan (Rabbit Hole, Proof) and featuring an all-star cast including Ian McShane (HBO’s “Deadwood”), 2-time Tony nominee Raul Esparza (Taboo, Company), Tony nominee Eve Best (A Moon for the Misbegotten) and Michael McKean (The Pajama Game, Best in Show, “Laverne & Shirley"). 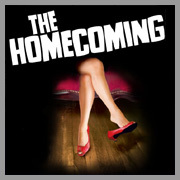 Undoubtedly Pinter’s most sexually provocative work, The Homecoming is an edgy and compelling tale of lust, seduction and deception, telling the story of a dysfunctional family that welcomes the homecoming of its estranged brother and competes for the attention of his dangerously alluring wife. The production was nominated for the 2008 Tony Award for Best Revival of a Play and Ms. Best and Mr. Esparza also received Tony nominations as Best Actress and Best Featured Actor respectively. The entire company was honored with the 2008 Drama Desk Award for Outstanding Ensemble Performance and the production also earned a 2008 Outer Critics Award for Outstanding Revival of a Play.